*This post contains affiliate links. If you purchase an item from one of these links, I’ll get a small commission. Is there any better flavor combination than cherries and almonds? I don’t know about you, but I struggle to eat enough calcium. I think most people who can’t eat dairy products have difficulty eating enough healthy sources of calcium. This healthy smoothie provides 60% of your calcium and is healthy enough to eat for breakfast, and tasty enough to be celebrated as a dessert. 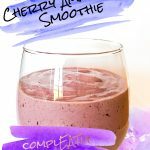 With all the protein and fiber in this smoothie, it fills me up for hours! Add all ingredients to the blender, and blend until smooth. You may need to scrape the chia seeds off the sides at some point. I usually find it easiest if I add the chia seeds close to the blades (so I add the chia seeds first if I'm using a standard blender, or last if I'm using a *cup style blender). Get the latest recipes right in your inbox! @2018 - Katie Davidson All Right Reserved.